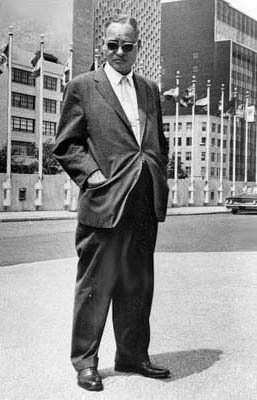 Ralph Bunche | "Mr. UN"
In December 1942 as the war raged in Europe, Africa and the Far East, the Institute of Pacific Relations sponsored an international conference in Mont Tremblant, Quebec, to consider the shape of the postwar world. Ralph Bunche was a member of the United States delegation. In his report to the conference, Bunche's called for a "unanimous and human recognition of the basic right of these people to a decent and dignified existence - a right they have never realized. [...] The real objective must always be the good life for all the people. International machinery will mean something to the common man throughout the world only when it is translated into terms that he can understand: peace, bread, housing, clothing, education, good health, and above all, the right to walk with dignity on the world's great boulevards." Attended by high-profile Allied representatives, the conference launched Bunche on his career as a leader in decolonization and trusteeship matters. In 1945, Bunche was one of the chief advisors to the US delegation to the San Francisco Conference that drafted the Charter of the United Nations. During the five months that the conference was in session, Bunche worked closely with US delegate, Harold Stassen, drafting and redrafting the chapters of the United Nations Charter dealing with the future of the colonial world. In 1953, in an address to the General Assembly, President Eisenhower made several proposals to promote the peaceful uses of atomic energy by all the nations of the world. These proposals were seen as also having the potential to open a dialogue between East and West. The United States and the Soviet Union, the world's two competing superpowers, involved in an escalating arms race, were focused on the development of more and more powerful and destructive atomic weapons. 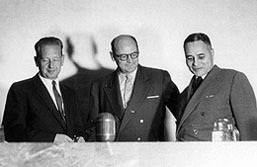 Secretary General Dag Hammarskjöld wanted to make sure that the United Nations would play a major role in this important international init iative and put Ralph Bunche in charge of setting up the International Atomic Energy Agency, and its "Atoms for Peace" project.